Another recipe for those of you with a sweet tooth. 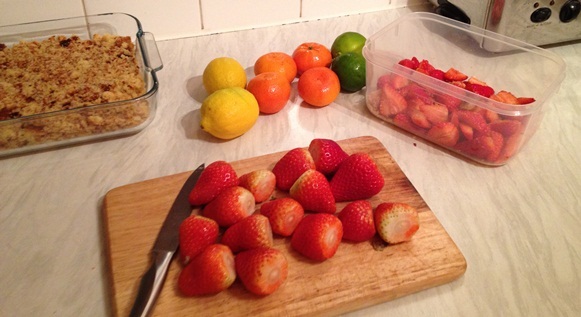 This one uses my Victoria sponge cake recipe for the cake base and then a load of strawberries, some lemons, limes and clementines or tangerines for the toppings. It’s a great recipe for using up leftover cake when you’ve made a shaped birthday or occasion cake where you’ve had to cut out the shape and have lots of off cuts. 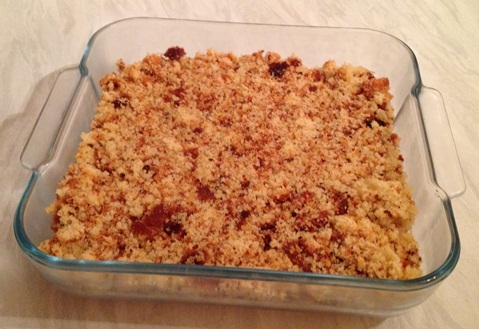 But the best thing about this recipe is that it is really easy to make, can be made in advance and a great dessert to serve up at a dinner party when your main meal takes a long time and/or you want to spend a bit more time with your guests and out of the kitchen. Before you start take your strawberries out of the fridge at least 30 mins before you begin the preparation. Wash and chop your strawberries into quarters. Put the strawberries in a bowl and sprinkle the sugar on top and then toss to ensure the sugar covers the strawberries evenly. Juice the two lemons, limes and the four clementines (or tangerines if clementines are not available) into a jug. Pour the juice over the strawberries and mix through evenly. Leave for one hour at room temperature. Crumble 500 g of Vanilla Sponge Cake (see my Victoria sponge cake recipe) into a bowl and level out. Spoon the strawberries over the Vanilla Sponge Cake Crumble mix evenly and then pour the remaining juice evenly over the entire mix. Leave for one hour to let the juice soak through the sponge mix. Serve with ice-cream, cream or custard and watch your guests salivate at the sight of this Fine Strawberry Mess! 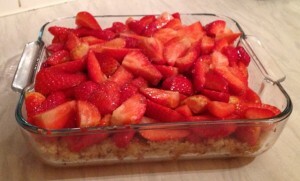 This entry was posted in Interests, My Blog and tagged cake, desert, recipe, ruth weal, strawberries, strawberry, wealie. Bookmark the permalink. This looks extremely yummy Ruth! I’m going to have to give it a try!